New Mexico has some of the brightest, most consistent sunlight in the nation, plus a solidly pro-solar state energy policy. Electricity rates are slightly below average, which sounds like good news but is not—low rates typically mean a lot of the state’s energy is coming from coal and will have a very high environmental cost later. You can help by going solar, and New Mexico gets so much sun that despite the low electricity rates you’ll save a ton of money by using solar panels. Some people worry that photovoltaic systems cost too much—and indeed they used to be pricy. 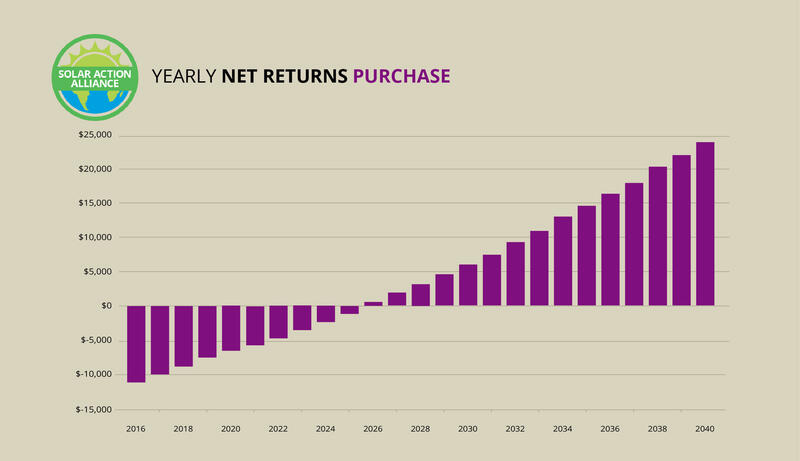 But as more systems have been built and shipped, the cost has come down dramatically, as the above graph shows. It’s called the Swanson Effect. In fact, the price of solar is still dropping. In New Mexico, you can buy your solar panel system outright, but, just like most states, you do have some other options as well. You can purchase equipment using a home equity line of credit (HELOC), or you can lease your panels. From this graph, it might seem at first that purchasing your system with cash is the best deal—by the end of the 25-year life of the equipment, a typical home might see total savings (plus payments for unused electricity) of almost $25,000. That’s much better than the outlook for either of your other two options. 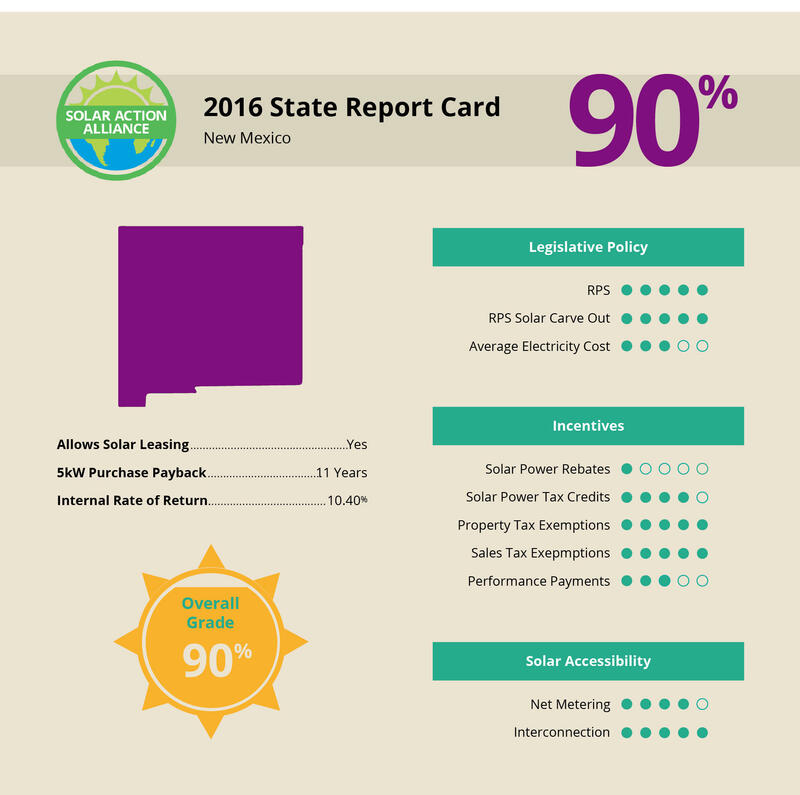 But buying a system outright will set you back almost $10,000 your first year because New Mexico doesn’t have a solar rebate program. Within a few years the system will pay for itself, but taking out a loan to make the purchase may offer the better return on your investment. Leasing the equipment offers a much lower return, but also carries much less risk. A typical home solar system in New Mexico might cost $20,000, but between state and Federal tax breaks and the value of the electricity you generate, you’ll only be down about $10,000 by the end of the year. Over the first ten years, the system will pay for itself—giving you roughly fifteen years of free electricity. Any power you do not use, you can sell. Plus, the value of your home goes up substantially. 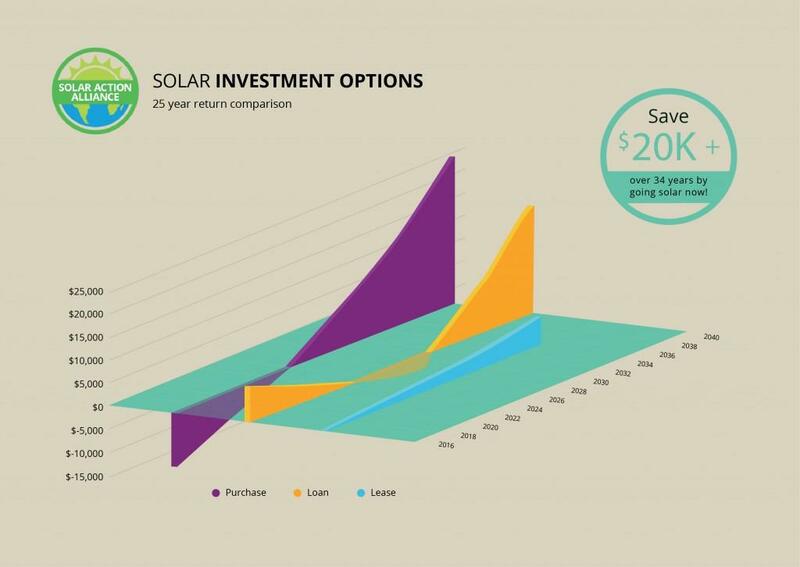 As the graph shows, by leasing you can get a solar system for no money down at all. Although your savings built up much more slowly—about $136 per year, for a typical home system—you do start saving from day one. The way it works is that you pay a monthly fee to have solar panels placed on your roof, but you do not receive an electric bill. Because your lease payments are lower than your electric bills would have been, you save money. A standard lease lasts for twenty years. With a leased system, you do not get tax breaks for owning solar panel equipment, nor can you get paid for the electricity generation you do not use. But if something goes wrong with your system, you don’t have to pay for the repair, either—the provider you lease from does. 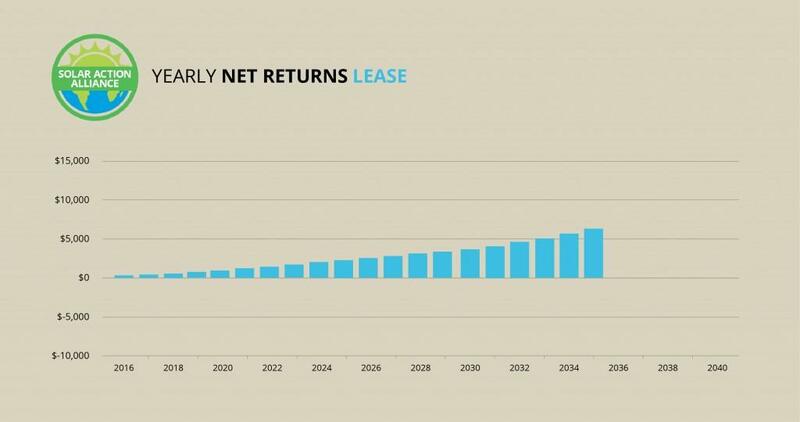 The graph for the return on a leased system looks a little odd. At first, you get a lot of money back, but then your savings drop off and for a few years you have to make payments. Then the money comes rolling in again for the remaining years of the equipment’s working life. The explanation is that payments on the interest of home equity loans are tax deductible but payments on the principle are not. 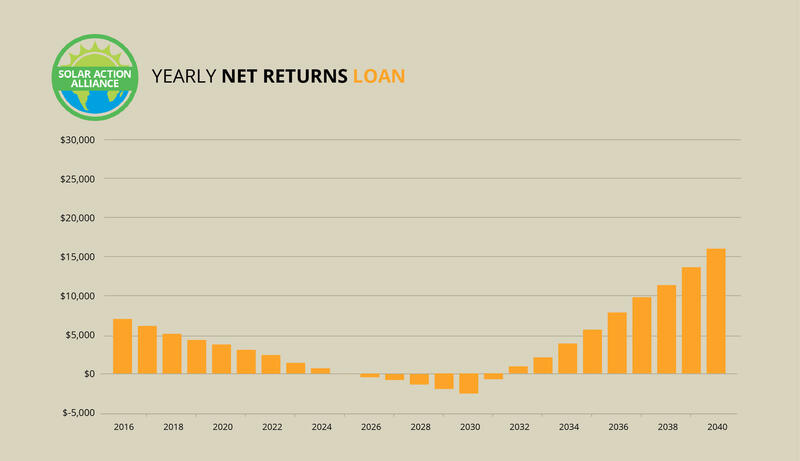 Because the first few years of loan payments mostly pay off interest, the savings on your electric bill can easily make up the difference and you come out ahead. As you start paying off the principle, you can deduct less and must pay more. In New Mexico, with a typical system it adds up to negative numbers for perhaps six years. But over the life of the system, you still get an excellent return—and you get all the benefits of ownership, the state and Federal tax breaks and payments for any extra electricity you generate and do not use. An RPS, or Renewables Portfolio Standard, sets how much of a state’s energy must come from clean renewables by a certain year. Electric companies that don’t meet the deadline must pay big fines. New Mexico has the eighth best RPS in the country, 30% by 2020. Energy companies have two ways to meet their obligation: they can increase their clean electricity generation capacity; or they can encourage customers to produce clean power for them. What it means for you is that in New Mexico, electric companies have plenty of incentive to get you going with your solar panel system. New Mexico is a good place to go solar—only six states in the nation do better. On top of its strong RPS, the state has the nation’s best solar carve-out (percent of power that must be from solar specifically) and policies that allow the owners of home systems to be paid for any extra electricity they generate through net metering. Three utility companies offer performance payments in the form of Solar Renewable Energy Credits (SRECs), an additional way to be paid for energy generation. The state has no rebate for solar panel equipment, but does have a state tax credit. New Mexico charges no sales tax for solar equipment and the value your solar system adds to your house is not taxed, either. The only real drawbacks are the relatively low electricity cost, the low performance payments, and the lack of rebates. New Mexico earns an A, not an A+, but that’s better than many states do. The bottom line is that residents of this state have a great opportunity to do the right thing and get off fossil fuel and into solar.